Meanwhile, coarsely chop shrimp. In medium bowl, combine shrimp, fish sauce, soy sauce, lime juice, and garlic; set aside. In nonstick 12-inch skillet, heat oil over medium-high heat. Add celery, carrots, and ginger; cook 2 minutes, stirring frequently. Add shrimp mixture and cook 1 to 2 minutes or just until shrimp turn opaque, stirring constantly. Remove skillet from heat; stir in half of cilantro and mint. 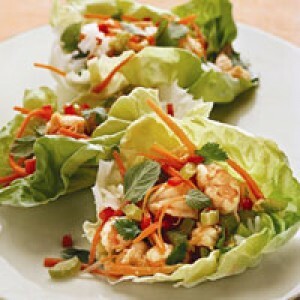 Divide rice among lettuce leaves; top with shrimp mixture and remaining herbs. Fold leaves over shrimp mixture and eat out of hand.